"Within the next generation, and certainly within our grandchildren’s generation, Earth will be as warm as it was 50 million years ago." In this clip from "Nature Visible and Invisible," Dr. Kiehl describes his perception of how visible and invisible aspects of our world impact on human actions relating to climate. He then uses a graph to display the temperature record of the last 100 million years on Earth, as gathered by studying oxygen isotopes. He explains that in the past Earth was much warmer that is it today, but models suggest that fossil fuel emissions may return our climate to a previous, warmer state at a rate much more rapid than has occurred before in the known history of the planet. 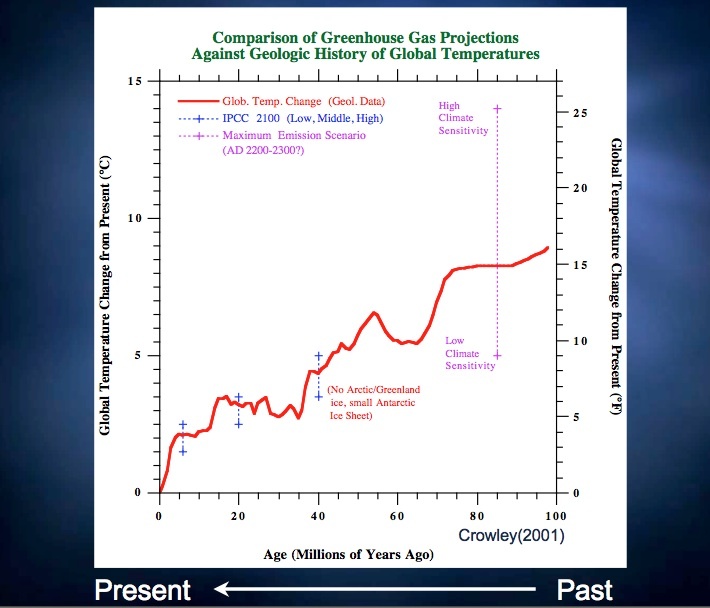 Dr. Kiehl’s graph is drawn from models that use current knowledge about carbon output and rates of energy use increase. Using this information, scientists can make educated guesses about how a system, such as Earth’s climate, may behave in the future. Scientists such as Dr. Kiehl are able to use models to make reasonable predictions about the future because there are many physical relationships we understand well enough to represent quantitatively. For example, carbon dioxide is known to be a greenhouse gas—a type of gas that traps long wave radiation in the atmosphere—and scientists understand pretty well the amount of energy that each amount of greenhouse gas is able to add to the climate system. Therefore, models are able to represent the impact of changing atmospheric concentrations of carbon dioxide on global average temperature. 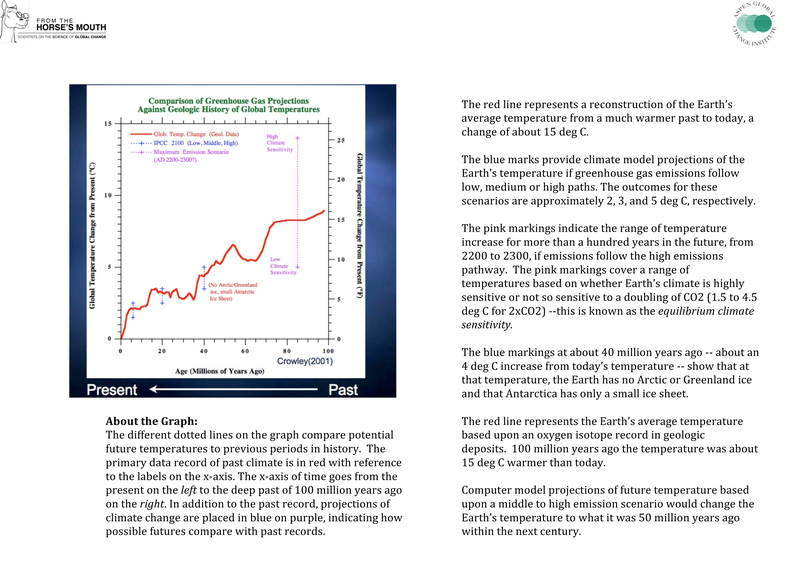 In this presentation, Dr. Kiehl uses models to indicate that within just a few human generations, the Earth’s average temperature could increase by 2-5 degrees Celsius (a change that would represent a major change in the Earth’s climate). The last known time when such a shift occurred, it took 50 million years to take place. The combined effects of the new, rapid rate of change and the significant amount of change would have major impacts on life as we know it, including: sea-level rise, agricultural impacts, extinction, water availability, and large changes in land and aquatic ecosystems. Avoiding these impacts will depend upon understanding the relationship between greenhouse gas emissions and temperature rise. Graphs such as Dr. Kiehl’s help to explore this relationship. What evidence does Dr. Kiehl use to substantiate his fundamental concern? When in Earth's geologic past is similar to the projected temperature increases for the Earth in the next 80 years? 50 million years ago, the Earth was around 5 degrees C warmer than it is today. What differences would you imagine on the Earth during that period compared with today in terms of plants, animals, and sea level? Why would these differences exist? What if our current world were to warm 5 degrees C in the next century? Recall that the change is not a temperature change for just one location; it is an increase in the overall average temperature of the whole planet. How might our planet be similar to the world of 50 million years ago? In what ways would it be different than that world even though the temperature is the same? Take a close look at the graph Dr. Kiehl shows in this clip. For each emissions scenario shown (the dotted lines), what is the range of global temperatures that might occur for each? Why is the range for the pink dotted line larger than that for the blue lines? The x-axis indicates time in years between the present (left) and 100 million years ago (right). 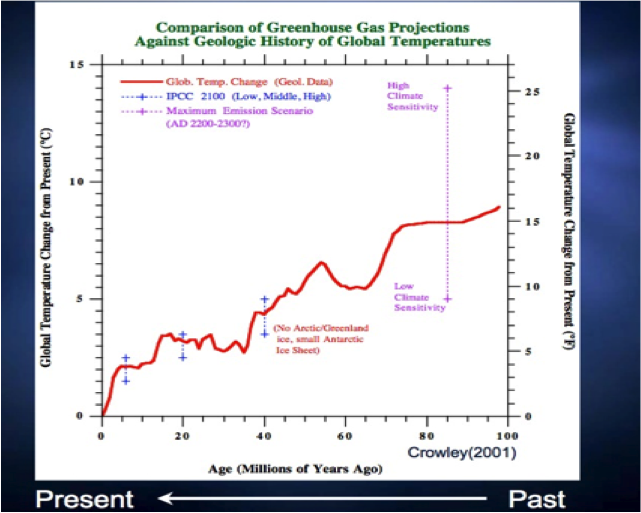 There are two different y-axis labels: the one on the left shows change in temperature from the present in degrees C. The right shows the same thing, but in degrees F.
The red line shows a reconstruction of how much warmer temperatures were in the past than they are today. The dotted lines indicate which past conditions future conditions might equal. The year the represented is listed in the key, the equivalent period in the past can be found on the x-axis, and the range of difference in temperature from the present can be found by looking at the y-axis. What was the Earth like 50 million years ago? Do you think humans can decide what average temperature the Earth should have? Why or why not? What do values and ethics have to do with climate change? 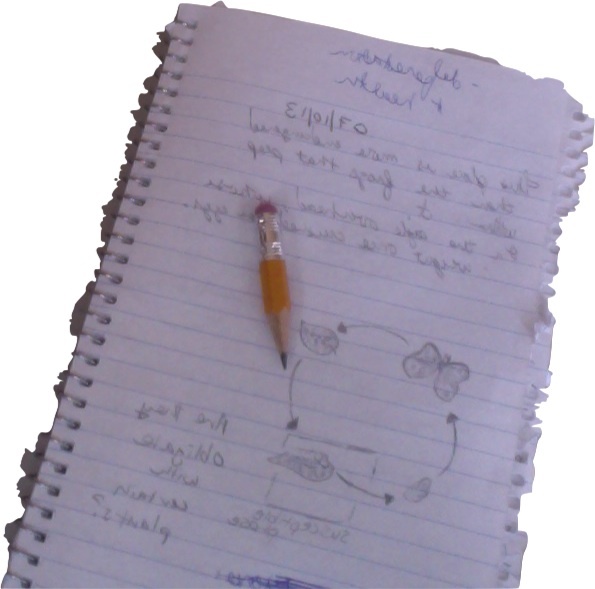 Devise your own strategy for digging deeper (ask a scientist, check out university or government agency websites like NASA and NOAA, go to the library, design and conduct an experiment, etc.) until you're satisfied the answer makes sense to you. How do scientists reconstruct 100 million years of Earth’s temperature? Kiehl, J. (2011). Lessons from Earth’s Past. Science. 331: 158-159. Access to this article requires a subscription; however, there is a free summary available at in Science Daily.